If you are following me on Twitter then you would know that I just bought some new food picks for bento. One of them is a candy set. 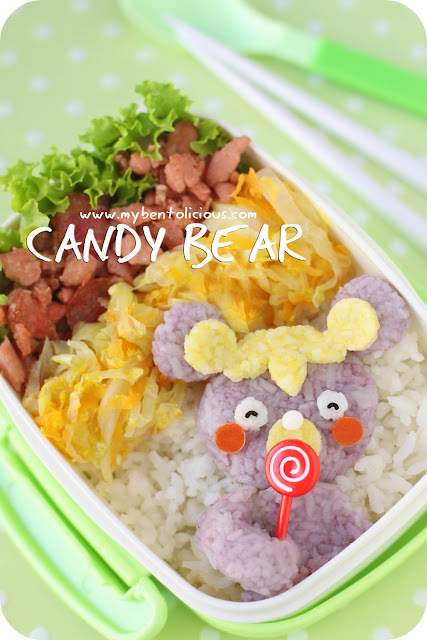 I tried to use one of the candy picks for today's bento by making this candy bear. I used purple and yellow deco furi, nori, jelly ball, red paprika, and steam rice to make the bear. I didn't have time to take a picture of deco furi this morning but I will take the picture tomorrow and post it along with my new food picks and tomorrow's bento on the blog. Inside the box : stir fried chicken char siu & lap cheong, and stir fried cabbage & carrot with garlic oil. Since the cooking was about stir fry, cooking happened pretty quick this morning. And everything in the box can be eaten in a room temperature which I love most when I prepare bento for the kids. They still can enjoy their bento and no need to reheat because the school doesn't provide a microwave oven to reheat their lunch. Love the cute bear and his lolly; so so cute! I have to catch up your posts, they are cute as always, Lia. I saw the foodpicks too by today.. I just like your bento. Every bento are so creative! Expecially on your eggs sheet. Oh he is just beyond cute. Very nice! the cutie bear looks like he's enjoying the lolly, so nice! @Anna : Thanks a lot Anna! The food, purple bear and lollipop are well displayed. They're great combination too. Love it! Just too delightful! Your inventivness and sweet themes knock me out Lia. I really love the cute bear and lollipop, thanks for the smile on an otherwise dreary midweek morning! That is just the most adorable way to incorporate a pick! You are so incredibly imaginative and quite truly, an artist with food! Oh! I love your candy picks so much! Tooooooo cute! Love the way you use the pick!